I haven’t been getting any actual comics done this week, but I did do a bunch of doodling in my sketchbook. Here’s a page. I was just going through my current stack of comics and drawing some of the characters in them. I’m a big fan of The Muppet Show Comic Book that BOOM Studios has been putting out, especially when Roger Langridge is doing the art. I’m also really digging DC Comics’ Jonah Hex book… it’s the only “straight” superhero book I’m buying regularly right now, and I guess it’s not even a superhero book, really. I picked up Image Comics’ Invincible last week on a whim, but I usually stick to reading that in trades. The Return of the Jedi speeder-bike is just something I felt like drawing. Elliot’s been playing with a lot of my old Star Wars figurines this month. Hey! Don’t forget! Tomorrow is Free Comic Book Day! If you go to your local comic book store, they should have tons of free comics for you to buy! Elliot and I are going to our LCBS, Up Up and Away Comics, tomorrow… bright and early. If you’ve never been, it’s a lot of fun and worth checking out. I’ve done the “draw myself into a story we’re reading” comic before, but I felt like this one was different enough not to make it repetitive. Axe Body Spray is an epidemic in middle and high schools. I personally don’t like the smell, but I must be an old fogie. Hey, just a few more days to vote for my classroom’s project on PepsiRefresh. Please take a moment and vote, if you have the time and the inclination. The seams are showing a bit insofar as one aspect of this project. 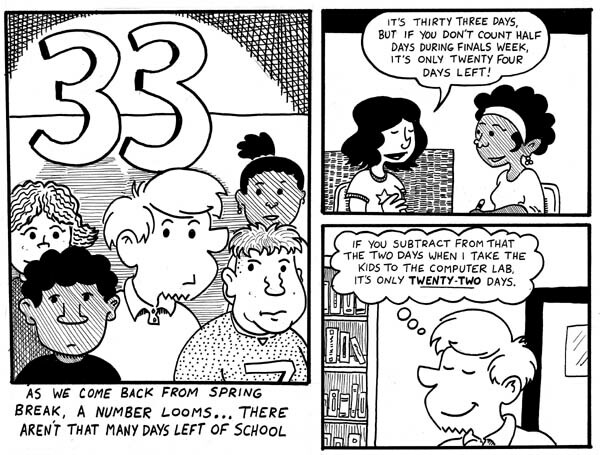 While there were only 33 days left when this comic was created, if you look at the title of this entry… well, that tells a significantly different story, doesn’t it? The reason for the discrepancy has everything to do with my “four comics a week” schedule. By the time school is actually finished (barring any missteps), I’ll probably top out at posting somewhere around 140 comics for a year that has 185 days. I have quite a few other comics that, for one reason or another, were held back from posting. I figured I’d just save those strips for the inevitable print collection of these strips and use the inclusion of new material as a selling point. Lately however, I’m realizing that collecting almost 200 comics in one volume is quite a lot to ask a potential reader… and it’s especially a lot to ask from a potential comic buyer. I’m looking at this year potentially as a “dry run” for next year, as I learned a lot about the comic (as pretentious as that sounds) as I got more and more into drawing it. I haven’t decided exactly what I plan on doing yet. 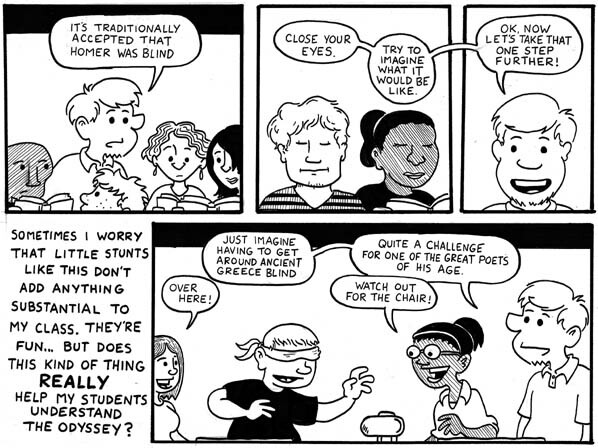 One option is to release smaller mini-comics based around the various semesters and quarters of a school year. 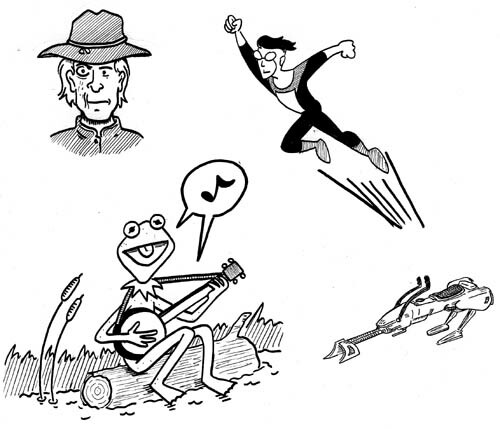 I might just do a “best of” collection… something like all my comics about teaching Romeo and Juliet. I guess it’s also possible that I will not do any kind of print collection. It’s still really up in the air. I just thought I’d address the weirdness between today’s comic’s content and the title of the strip, before anybody else did! 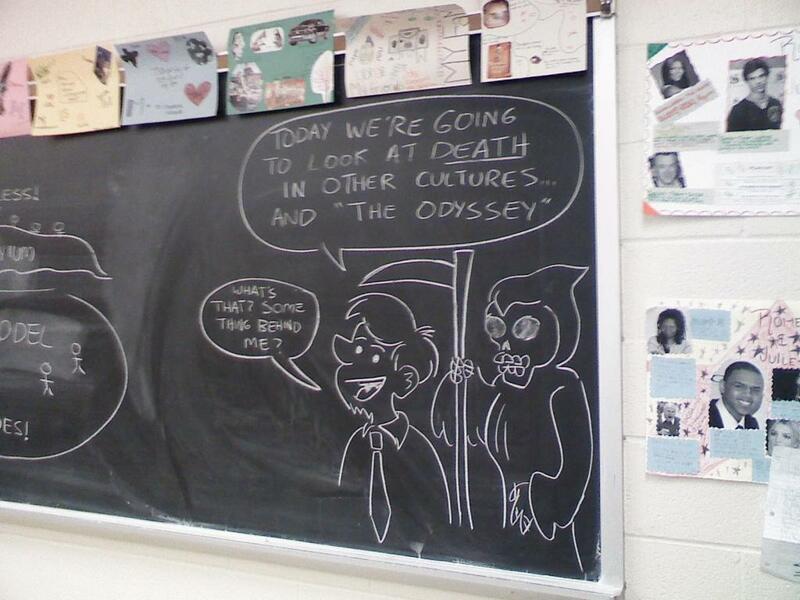 We’re currently knee-deep in The Odyssey in my classroom, so a lot of my chalkboard drawings relate to that classic. For example, this one references the bag of wind that Aeolus gave Odysseus that would (if unopened) help him to make his way back to Ithaca. 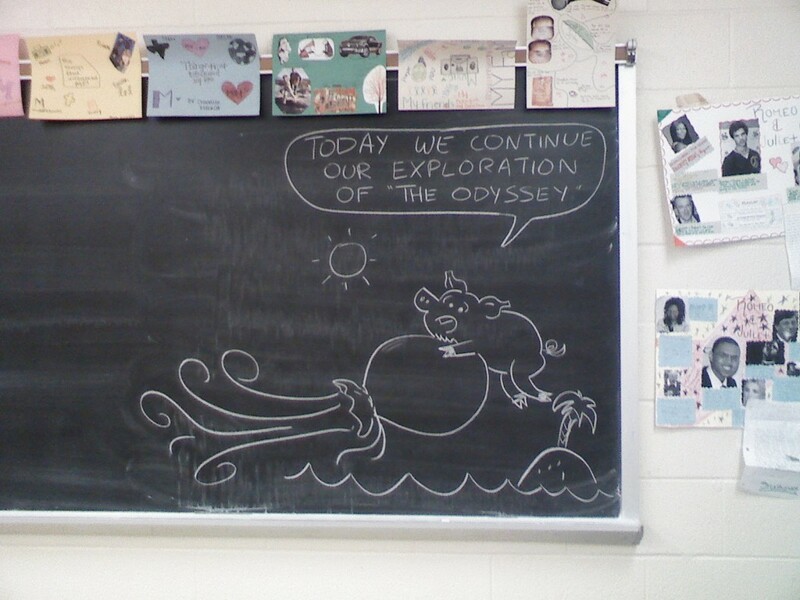 The pig is a reference to the encounter that Odysseus’ men had with the goddess Circe. We read both encounters on the same day, so it seemed fitting to cram ’em together. 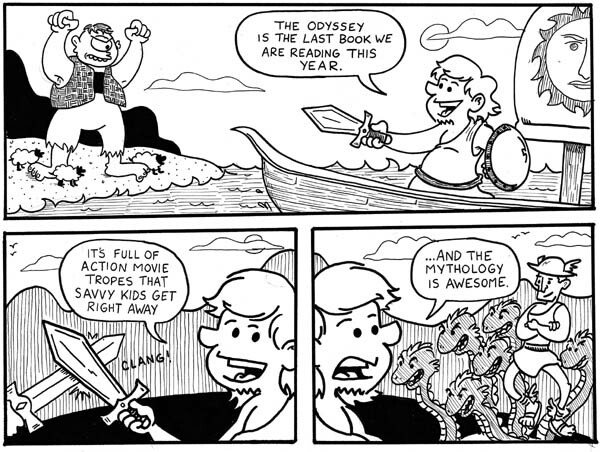 …and similarly here, we were reading about Odysseus’ descent into the Underworld. 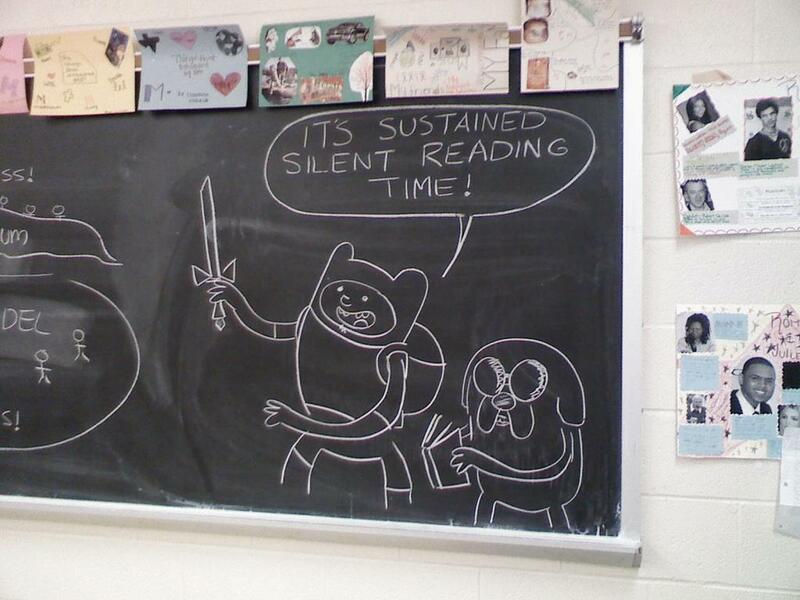 This one has nothing to do with The Odyssey, I’m just a gigantic fan of Cartoon Network’s Adventure Time With Finn and Jake. It’s probably the most wonderful looking animated series I’ve seen in a decade. A doodle I drew in a meeting that went late yesterday. As any obsessive child of the 1980’s remembers, there were TWO Ghostbusters cartoons for us to enjoy. Most (including myself) preferred The Real Ghostbusters, a direct adaptation of the 1984 horror/comedy movie starring Bill Murray… however Filmation (the animation studio responsible for Fat Albert, He-Man, and She-Ra) also produced their version of Ghostbusters. 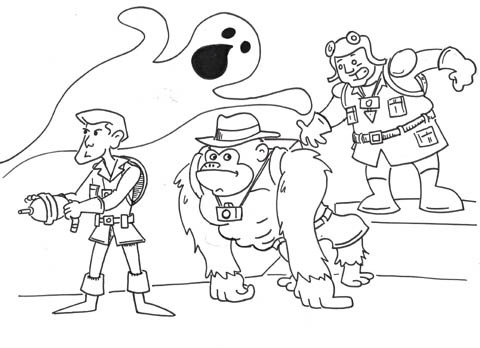 Filmation was able to do this in a roundabout fashion due to the fact that the name “Ghost Busters” originates from a live action TV series from the 1970’s starring Forrest Tucker and Larry Storch. As this cartoon was an adaptation of that live action show and NOT the movie, Filmation was able to capitalize on the success of Ghostbusters without paying for the rights to make a series out of the movie. You are currently browsing the Teachable Moments blog archives for April, 2010.